Moving a cone 10 high temperature glaze down to cone 5-6 can require major surgery on the recipe or the transplantation of the color and surface mechanisms into a similar cone 6 base glaze. 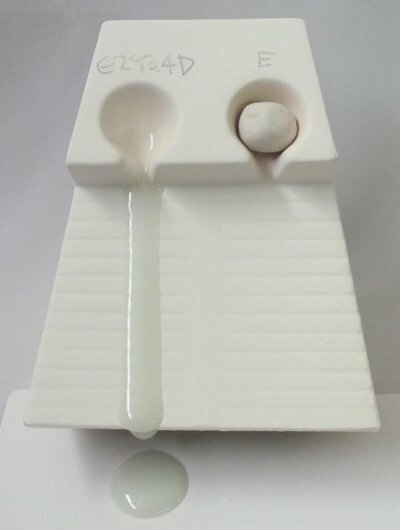 It is amazing how many potters or small scale manufacturers will push their clay bodies or kilns (and utility bills) to the temperature limit to get a special reactive glaze to melt the way they want. No industrial manufacturer could afford or would have the desire to do this, it only makes sense to fire to the lowest possible temperature and as fast as possible (typical industrial firings last as little as one hour these days). It takes much more energy, for example, in a typical poorly insulated kiln (any inexpensive kiln is poorly insulated) to increase the temperature by 1 degree at 1000C than it does to do the same at 500C. Obviously, lower temperatures also mean less wear and tear on kilns, especially electric. Not so obviously, it can be easier to keep the temperature even throughout the kiln at lower temperatures and thus either easier to soak at the end or shut it off in (with an even-temperature condition throughout the kiln chamber at shut-off time). In addition, at lower temperatures kilns have an easier time holding to a programmed schedule (and thus maintaining consistency firing-after-firing is easier). At the same time it does not make sense to fire too low either since quality and strength issues come into play below about cone 1 using traditional bodies and glazes. It is important to realize that high temperature firing is not a requirement for strength and quality ware. Also, the range of achievable colors and color consistency is better at lower temperatures. Lower fired bodies can also be very dense and strong. Dental porcelain, albeit an extreme example, completely melts into a white pool of glass far lower than any typical functional porcelain would even begin to densify. Admittedly the mullite-glass-silica microstructure characteristic of high temperature porcelains is not as highly developed in middle-fire bodies, but other strength-imparting crystalline matrixes can be employed. But even with the simple glass-bonding-of-aggregates mechanism you need make no apologies for cone 4-6 porcelain strength (when I say 'cone 6' below I mean cone 4-6, or, middle temperatures). The question is: Can you juggle the amounts (e.g. increase the fluxes) of ingredients in a typical cone 10 glaze recipe to make it melt at cone 6? The answer is almost always no. Middle and high fire glazes employ different fluxing oxides and they interact differently. To understand, let's fire lower for a moment. Low fire glazes (cone 06-02) are fundamentally different in a one principal way, they contain lots of boron, it is the key and principle flux. Cone 10 glazes contain none. Additionally, oxides that behave as fluxes at cone 10, like MgO and CaO, act as refractory matting agents at low fire! Cone 5-6 is a bit of an in-between land in this sense. Some boron is almost always needed because common cone 10 fluxes like feldspars, calcium carbonate, talc and dolomite do not melt well at all at cone 5. Thus, increasing the content of existing cone 10 fluxes to melt at cone 6 will not work, you must introduce new more powerful (better melting) ones and learn a new set of dynamics, interactions and tradeoffs. 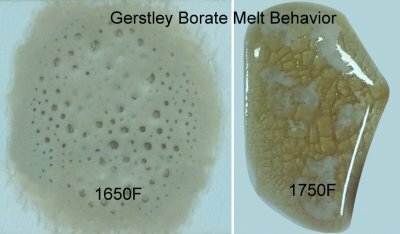 There are some special purpose middle-temperature glazes that will melt without boron (e.g. high zinc fast fire or bristol glazes) but these often require special expertise and lots of tolerance, I will not discuss them. Pure mineral flux particles like dolomite, whiting and talc are active melters at cone 10 but certainly not at cone 6. You could increase them all you like, you'll never get a workable cone 6 glaze. By 'workable' I mean that although you might be able to get it to melt, so much of the recipe would be taken up by these materials that a stable low expansion glaze could not be created for the lack of alumina and silica. Kaolin and ball clays are refractory (melt high) and (they have to be dissolved by other things). To reduce a glaze's melting range the percentage of these materials obviously must be reduced when reducing the temperature. However their amounts can only be taken down to about 15% or the glaze slurry won't suspend or dry hard (unless you employ organic binders that introduce side effects not easily dealt with by potters or small operations). More important, clays are the key alumina supplier, taking them too low will detrimentally affect glaze hardness and melt viscosity and increase thermal expansion. Silica is the key glass building oxide in any glaze, most glazes need at least some raw quartz powder in the recipe. But quartz is no where close to melting at stoneware temperatures, it has to be dissolved by other materials that create a fluid melt. Attempting to employ high temperature fluxes at cone 6 is not going to dissolve any badly needed silica into a melt. Feldspars (and Nepheline Syenite) have complex chemistries and soften over a range of temperatures, they begin to melt at cone 6. However they don't melt well. If you add enough high-thermal-expansion feldspar to a high fire glaze to melt it at cone 6 you will have a guaranteed crazing glaze as well as one that is likely to leach because sodium and potassium will be oversupplied. The bottom line is that we cannot just reorganize a cone 10 recipe to melt at cone 6. We must add something new, a flux or fluxes not normally found in cone 10 glazes. We must also reduce the proportion of silica and alumina in the glaze, since even with added fluxes it is not possible to get a glaze to dissolve the amounts of high melting alumina and silica typically found in cone 10 glazes. I am not saying it is impossible, you might be the magician who has found a way. But remember, the challenge here is to adjust an existing cone 10 recipe to melt at cone 5- 6 and not craze or leach or scratch easily and still have good application and working properties. That is not easy. I want to point out that when I say we need to 'add something new', I did not mean a material. I meant an oxide. Materials are composed of oxides, and most materials contribute more than one oxide (sometimes 6 or 8 different ones, e.g. feldspars). When you talk about a fired glaze and the way it melts and solidifies, you are talking mainly about chemistry (oxides), whether you like it or not. If we add or remove feldspar, for example, we are making a fundamental change in the balance of oxides in the glaze (because it contributes so many oxides), that does not jibe with the objective of making changes that will give the greatest reduction in melting behavior accompanied by the least change in overall glaze appearance and fired properties (e.g. color response, thermal expansion, surface character, working properties). There are two main approaches we can take. What gives it the color? Is it a stain, a metal oxide, a stained clay or mineral, or the growth of micro-crystals (surface or entrained) that have a characteristic color? Put this 'mechanism' into a cone 6 base. Note however that you need to think about whether a color depends on a sympathetic chemistry in the base glaze. When employed in slow firing, some stains for example, require that the base glaze be zinc or magnesia free. Others require the presence of a certain amount of CaO. Crystallization effects from raw metal oxide powders likewise depend on the presence of specific oxides and amounts. Is the glaze opaque or transparent? If it is a deep and vibrant color, especially one that is darker where the glaze is thicker, it is likely a transparent that contains a colorant that can be seen deep into the glass layer. If it has a pastel surface it likely contains a colorant plus has an opacity mechanism (contains an opacifier, is crystallizing, or is not completely melting). If it has a variation in coloration (without variation in thickness) then there may be some sort of crystallization going on to produce the color. If it is just white all over then it is opacified. If the white turns to transparent or different colored at contour edges, then crystallization is likely involved in the opacity mechanism (e.g. from titanium dioxide). Actually, just look at the recipe. Does it have an opacifier like tin oxide, titanium or zircopax? Does it have a colorant like cobalt or chrome oxide? Non crystallizing opacification and color mechanisms will often transplant into another base. Is the glaze variegated or mottled? If the effect is a result of the presence of rutile or titanium then transplant either material into the cone 6 base glaze. Does the glaze have speckles that are a product of a granular or unground material? If so transplant these contributors into the new recipe. If the speckles blossom or bleed in the original you may need to choose a different specking agent for cone 6 (for example, use granular manganese instead of granular illmenite. There are other factors that are not as easy to transplant. These often relate to visual effects in glazes that are very fluid or runny. For example, glazes that form small or large crystals or a crystal mesh across sections of the surface during cooling need to have a very fluid melt. Often matte cone 10 glazes are actually over-fired cone 6 or 8 glossy glazes that have completely crystallized. For this type of glaze you will need to have an equally fluid melt in the cone 6 range to transplant things into (that means it is going to need to melt well at cone 2-3). This will not be easy since getting a glaze to melt that low means removing much of the low expansion silica and alumina, that in turn leads to crazing. Another mechanism that is not easy to transplant is the character of the surface. Dolomite matte glazes, for example, have a pleasant silky surface that is a product of what CaO and MgO do around cone 10 in slow firing in the right host glaze (by slow firing I mean over a period of hours rather than minutes as is common in industry). Obviously you cannot duplicate this exact mechanism because MgO does not suddenly melt at cone 6 the way it does at cone 10. You must create or find a base that already has the surface you want (or adjust one that is close since matteness is a product of the glazes chemistry, that is, the mix of oxides it contains). Fortunately, at cone 6 various types of matte surfaces are also possible. Additionally, you can actually use a mechanical technical to duplicate the dolomite matte effect: Apply a thin layer of matte glaze over a glossy under layer, the upper layer can variegate in a similar manner. The magic oxide is boron (B2O3). The reason boron is such an ideal additive is that it is more than a flux, it is a glass like silica, yet it melts low. This is a marvelous oxide! One of the beauties of boron is that it is compatible with most colorant, matte and variegation mechanisms. But there is another even more important reason: Boron has a low thermal expansion; additions of it will reduce glaze crazing. This is so important because most high temperature glazes contain far more high-expansion Na2O, K2O than can be tolerated at cone 6 without producing crazing. In addition the low-expansion silica and alumina they contain must be reduced to achieve melting at cone 6, thus moving the glaze toward crazing. The next questions is: What source of boron should you use? The answer is: frits. There is a boron frit out there to meet almost any fluxing challenge. However each frit contributes other oxides besides boron. This means that to reach the goal of only increasing the boron in a glaze you need to be able to reduce other materials in the recipe that contribute the same non-boron oxides as the frit. Thus, to do what I am about to describe, you need a glaze chemistry. The kinds of material juggling I am about to describe are dealt with in the videos on digitalfire.com. The first thing to consider is this: Does the glaze need clay (does it settle in the bucket or lack dry hardness?) or does it have too much clay already (does it shrink and crack on drying?). If the former, use something like Ferro Frit 3134 (20% CaO 10% Na2O, 23% B2O3, 46% SiO2). Why? Since it contributes Na2O and CaO, that means you will be able to reduce the amount of feldspar and whiting/dolomite/wollastonite in the glaze (a pre-melted frit melts so much better than any of these materials). That reduction will also mean a loss of Al2O3, but since the frit contains none you will be able to supply the Al2O3 using a kaolin. If the glaze already has too much clay, then use Frit 3124, it has almost the same chemistry, but it sources alumina also (meaning you can reduce alumina-contributing clay). If the amount of clay in the glaze is OK, then try Frit 3195, it is balanced enough to be a glaze in itself. The second last question is: What level should the Al2O3 and SiO2 be at in the newly adjusted glaze? An obvious suggestion might be to adjust them to about 2/3 of what they were. However, a rule of thumb is to always have as much alumina and silica as you can in a glaze. But, since B2O3 (boron) performs the same function as silica you can afford to have lower SiO2 in the interests of good melting. Also, boron has very good alumina-dissolving abilities, thus it is often possible to leave Al2O3 at the same levels as it was in the cone 10 glaze. Boron is really great stuff! The last question is: How much boron do I add? I would start with about 0.3 molar equivalents. If the glaze is reactive and has to be very runny to achieve the desired effect (like the ones in the book "Mastering Glazes"), you might have to take the boron as high as 0.8. If the cone 10 glaze is a stoney matte and is not melting enough, then to duplicate it faithfully I guess you have to make a cone 6 glaze that is not really melting enough either. However this is certainly not advisable for functional ware. You will want to fire tests to compare the degree if melting (consider using a melt flow tester). Be sure to try the glaze in thick and thin layers and watch for crazing and leaching. Different minerals release their oxides to the melt at different temperatures, even though they might have similar chemistries (for example wollastonite and whiting both contribute CaO yet the latter requires a higher temperature to release it to the melt). Following are some glazes common to cone 10. Bear in mind that matte effects can be achieved by different mechanisms (e.g. Crystallization, incomplete melting, phase separation, prevention of surface levelout by rivulet formation or melt stiffening due to the presence of refractory or non-dissolving components or oxides like Al2O3 or zircon). Some of these mechanisms are a product of slow firing and thus not available in industry. Thus you need to select a matte of similar type to transfer properly, however bear in mind that colorants can affect matteness depending on the fragility of the effect (if you have used matte glazes for a long time you will know what I mean by this). One effect of cone 10 that can be difficult to duplicate is the dolomite or magnesia matte (the phase separation produces the micro rivulet surface of melting pockets of MgO) with its very pleasant silky surface. White matte: Just opacify a cone 5-6 matte base glaze using Zircopax or tin oxide. Silky matte: Apply a matte as a second layer over a glossy. Tenmoku: Use high iron in a high-boron fluid base. However you will not get the same light brown crystal lines on the edges of contours. However, like many any such special effects, this can be synthesized using an overlay of the brown color. 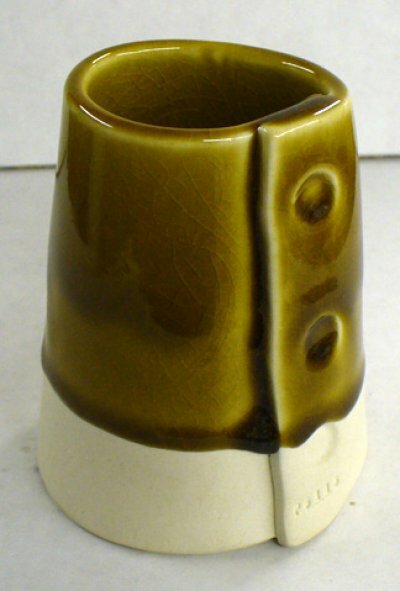 Also, at cone 6 this type of glaze can crystallize to a yellowish color (rather than maroon) if cooled too slowly. Robins Egg blue: Add a little cobalt and rutile to a matte glaze. Black: Add a black stain to a clear glossy glaze. Purple/Lavender: Use a high magnesia base clear (use Frit 3249 or Fusion F69 to source the MgO because MgO sourcing raw materials will not melt well at cone 6) and add cobalt carbonate or oxide (or a blue stain) around 1% and adjust as needed. Celadon: Add a green celadon stain to your clear base. Oatmeal/Cream: Add some iron, a light brown stain or rutile (rutile will also variegate it). Add a little Zircopax to opacify if necessary (to bring out the pastel effect). Why does this glaze look like this? What are its mechanisms? This is cone 6 an oxidation transparent glaze having enough flux (from a boron frit or Gerstley Borate) to make it melt very well, that is why it is running. Iron oxide has been added (around 5%) producing this transparent amber effect. Darker coloration occurs where the glaze has run thicker. These are all simple mechanisms, which, once understood, can be transplanted into other glazes. This glaze is also crazing. This commonly occurs when the flux used is high in K2O and Na2O (the highest expansion fluxing oxides). K2O and Na2O produce the brilliant gloss. They come from feldspars, nepheline syenite and are high in certain frits. This is an example of how useful a flow tester can be to check new glaze recipes before putting them on ware and into your kiln. This was fired to only cone 4, yet that fritted glaze on the left is completely over-melted. The other one is not doing anything at all. These balls are easy to make, you only need weigh out a 50 gram batch of glaze, screen it, then pour it on a plaster bat until it is dewatered enough to be plastic enough to roll these 10 gram balls. Glazes must be completely melted to be functional, hard and strong. Many are not. This compares two glazes to make the difference clear. A base transparent glaze recipe created by Tony Hansen for Plainsman Clays, it fires high gloss and ultra clear with low melt mobility.